Hey guys! I’m back with part three (and the final) recap of our recent trip to the islands. The downside of traveling to celebrate an October anniversary is that there are so many things going on this time of year. So, I apologize for the delay in getting this post up. In case you missed the other posts, you can read part one and part two here. Confession — I have a hard time relaxing when I'm on vacation. I feel like I need to make the most of every second and see everything I possibly can. With that being said, Whit and I managed to visit five different islands over the duration of our trip. I felt pretty good about that considering we were only there for seven days. The next island on our list to venture to was to Virgin Gorda. It's the third largest island in the BVI's and known for it's natural beauty, specifically The Baths. We have some friends who have visited before and have shared nothing but amazing remarks about the island, especially The Baths. We departed Scrub Island on a ferry to Trellis Bay, caught a second ferry to Virgin Gorda, then hopped in a cab to get to our destination. Did I mention if we ever go back, we are renting our own sail boat? Getting around from island to island can be a bit challenging due to the ferry schedules, but worth it. We arrived at The Baths and began our adventure through the dark caves filled with waist deep water. 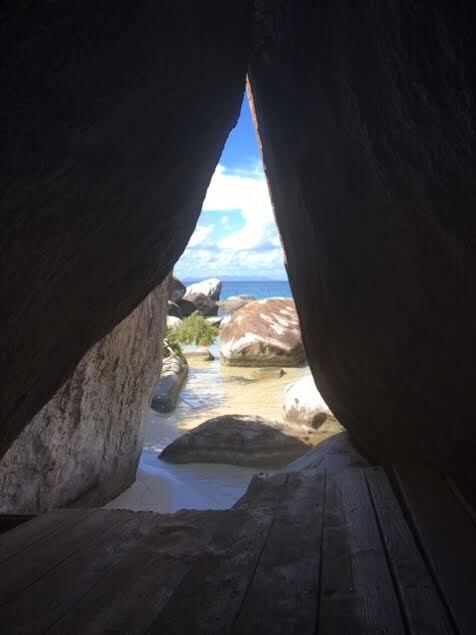 The Baths seem as if someone dropped off a few enormous boulders on a white sandy beach, encompassed by glistening turquoise water, creating an awe inspiring view. At first it was a little nerve racking, squeezing through the openings, not knowing what was around the next corner, but it was also exciting at the same time. Thankfully I was able to keep the camera dry! And when we made it to the end, this was our breathtaking view….. This really was one of the highlights of our trip. I felt like we were living inside of a stock photo you would come across on the internet. It truly was amazing. After our cave exploration, we decided to grab a bite to eat back up at the top of the hill instead of taking a cab into town. Talk about lunch with a view, am I right? We ate at Top of the Baths Restaurant. The jerk chicken sandwich was just what I needed. We pretty much had seen what we intended to and decided to move on after eating. Fortunately, we had gotten the scoop from the co-captain on our boat excursion the day before. She had shared with us a few places we should visit while on Virgin Gorda. Again, we hopped on another ferry which took us to our next stop — Saba Rock. It was the perfect spot to sip a cold beer, relax and take in the beautiful view. Saba Rock is a small island, approximately an acre and a half in size with a cozy hotel, restaurant, bar, and gift shop. And there is a dock is available for day visitors like us. It's located in the North Sound of Virgin Gorda, which is comprised of a small cluster of islands — basically a boaters dream world. There just so happened to be some sail boat classes going on which made for quite the entertainment. There was one last stop we were told we needed to make before heading back to our hotel and that was Bitter End Yatch Club, which could be seen just across the water way from Saba Rock. A ferry shuttled us right over for one last ice cold beverage and dip in the turquoise water. It was the perfect way to spend our last afternoon on the island. After a successful day of exploring and our share of sun exposure, we headed back to relax and enjoy dinner at our resort. Creamy Seafood Egg Pasta Pappardelle at Tierra! Tierra! for the win! And an "unfair" game of checkers to finish off the night. Notice Whit's hand about to pull the board off the table? It was extremely difficult to leave our beautiful resort the next morning. I made sure to soak up every last minute we had left on the island, starting with breakfast down by the pier. There is a gourmet market and cafe at the marina where you can grab hot breakfast sandwiches, deli meats and cheese for lunch and pizza, as well as a few groceries if needed. This was actually one of our favorite spots to get breakfast. I also had to get one last dip in the pool before we said goodbye. Another successful anniversary trip in the books! We thoroughly enjoyed our time in both the U.S. and British Virgin Islands. I will admit, just based on our experiences, the British Virgin Islands was our favorite. We look forward to planning a return visit in the near future!